An Australian Government advisory panel has recommended a national Year 1 literacy check with a focus on phonics. Today’s reader submission is by Sir Jim Rose, author of the influential 2006 UK report The Independent review of the teaching of early reading, which led to the adoption of mandatory teaching of systematic synthetic phonics in English primary schools. Here, he discusses ‘the simple view of reading’ and its implications, and the role of phonics in teaching reading. Darwin’s theory of evolution was once heralded as the best idea that anyone has ever had. T.H. Huxley, the foremost biologist of his day, said: ‘How stupid of me not to have thought of it!’ I suspect that many of us have thought likewise when we fail to spot the seemingly obvious. That was certainly my reaction when I discovered the ‘Simple View of Reading’, first proposed by Gough and Tumner in the 1980s (Gough & Tumner, 1986). Surprisingly, the importance of the Simple View of Reading was a blind spot in our vision on the teaching of reading that went unrecognised in England for years. In 2005, however, in pursuit of a conceptual model for our Review of Early Reading (Rose, 2006), I benefitted immensely from advice on the simple view of reading, and much else, from two eminent Professors – Morag Stuart and Rhona Stainthorp. In consequence, the Simple View of Reading became a key feature of our Review. How well this seminal insight has since been promoted in teacher training, and in framing school and national policies for teaching reading, remains uncertain. This article argues for a deeper understanding of the Simple View of Reading and how it has transformed perspectives on what it takes for beginners of any age to become fully-fledged readers capable of achieving high standards of literacy. 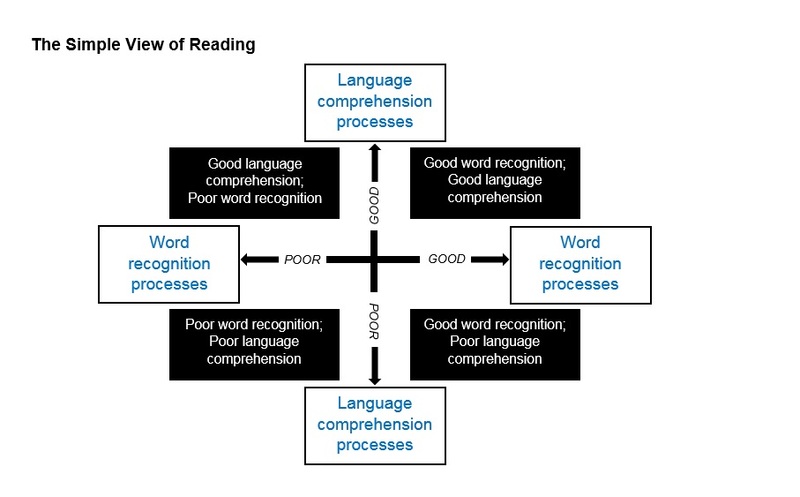 The Simple View of Reading differentiates between two dimensions of reading: Word recognition processes and Language comprehension processes. It makes clear that different kinds of teaching are necessary to promote word recognition skills from those needed to foster the comprehension of spoken and written language, which is the goal of reading. Though considered separately, both dimensions are essential to reading. It is of first importance for teachers of reading to be clear about which of these two dimensions their teaching aims to develop, and make sure each of them is taught explicitly. In recent years, much research has sought to identify the vital ingredients of the reading porridge. The broad consensus is that there are five, key, interdependent elements which must be secured and taught thoroughly for a reading programme to be effective. Comprehension. Understanding the meaning and intent of the text. There is some debate as to whether a sixth element, notably, ‘oral language’, should be added to this list, or whether the promotion and enrichment of oral language is best seen as a crucial, overarching aim of the whole curriculum from the early years onwards. The teaching of reading is by no means unique in seeking to apply the findings of authoritative, high quality, research to establish ‘what works best’. The route from research to the classroom, however, is often problematic in making the key messages accessible and clear to those who are expected to apply them, notably, frontline teachers. Experience teaches that important messages from research may be lost in translation – or rather, like Chinese whispers, they become increasingly distorted by misinterpretations. Only a fool would believe, for example, that phonics is the ‘be-all-and-end-all’ of learning to read. It would be equally foolish, however, to ignore the fact that an overwhelming amount of leading-edge research now strongly supports the message that a thorough grounding in phonics is essential but not sufficient to becoming a skilled reader. In our language system, children must learn how the alphabet works for reading and writing – ‘the alphabetic principle’. To this end, an emphasis on one key element of the Simple View of Reading, notably, decoding, has been necessary to restore the alphabetic principle to its essential place in teaching beginners to become skilled readers. The downside of this, however, has been a ‘phony war about phonics’. This has fuelled an anti-phonics lobby, much to the disadvantage of children, especially those who struggle to learn to read, and despite the fact that: ‘… studies of reading development, studies of specific instructional practices, studies of teachers and schools found to be effective – converge on the conclusion that attention to small units in early reading instruction is helpful for all children, harmful for none, and crucial for some’ (Snow & Juel, 2005, pp. 501–520). It is not only phonics, of course, that has fuelled fierce debate about reading. Equally controversial in recent times, some would say, is the issue of how best to help children deemed to be dyslexic. Attempts to segment and define the various elements of reading failure have raised questions about the term ‘dyslexia’, whether it exists and, if so, to what extent. Though beyond the scope of this article, it is worth noting that the Simple View of Reading strongly supports the view that dyslexia is essentially a word-processing problem. The highly respected researcher David Kilpatrick has suggested that the first diagnostic question when a teacher says a student struggles with reading should be: ‘What if you read the passage to him, would he understand it?’ As Kilpatrick points out: ‘Simply defined, dyslexia refers to a difficulty in developing word-level reading skills despite adequate instructional opportunities’ (Kilpatrick, 2015). This, of course, prompts the question: how adequate were the student’s instructional opportunities? In other words, was the teaching inadequate? If so, how can it be improved? Considerable progress has been made on mapping the complex warp and weft of dyslexia – neurological and otherwise. Mark Seidenberg, another leading-edge researcher into reading who has contributed hugely to the discourse on dyslexia comments: ‘The condition may be complex, but the by-product of this deeper understanding is the realisation that there are both more opportunities to prevent reading impairments and more ways to address them should they develop than earlier theories allowed’ (Seidenberg, 2017, p.168). This suggests that dyslexia may not be immutable. We need to travel in the faith that it is within the reach of a breakthrough despite the limitations of our current knowledge. Meanwhile, we would do well to remember that science insists that ‘absence of evidence is not evidence of absence’ and ‘correlation is not the same as causation’. Good science challenges consensus, and the nature of good research is to beget more research into the as yet unknown elements of learning to read as all else. All of which underlines the importance of making sure that we spell out, and continue to update, the line of best fit from research and proven practice, so that teachers are not left feeling that they are at the mercy of rows and rows of backseat drivers pointing in different directions. Rose, J. (2006). Independent review of the teaching of early reading: Final report. Department for Education and Skills. Seidenberg, M. (2017). Language at the Speed of Sight. Basic Books. Snow, C. E., & Juel, C. (2005). Teaching children to read: What do we know about how to do it? In M. J. Snowling & C. Hulme (Eds. ), The science of reading: A handbook. Oxford, UK: Blackwell. Sir Jim’s 2006 final report on The Independent review of the teaching of early reading can be downloaded by clicking on the link (432KB). The problem is that over in the UK, the Simple View of Reading became the Simple View of Phonics with comprehension and vocabulary development largely ignored. As such, after ten years of intensive SSP delivery, literacy is not improving in the UK at either age 11 or at 16 in spite of an enormous amount of time and money being dedicated to phonics training, delivery and testing. The Simple View of Reading is crucial to the initial teaching of reading and I agree strongly with most of this article. I am concerned that the inclusion of phonemic awareness in the list of essential components may result in teachers thinking that children must be phonemically aware before being taught to read. This is not the case. When children are taught systematic synthetic phonics well, they become phonemically aware as a result. I find this article fascinating at the same time fraught with some danger of being misrepresented by the untrained mind. My reasons for saying to is the following. 2. Reading Comprehension of ability is a function of not just decoding and linguistic comprehension it is much more eg. level of pedagogy, level of cognition, level of scaffolding, level of transcription, level of paraphrasing, quality of the text read, ability to vocalize (oral output), mentalization (due to my lack of a suitable word not yet invented), deficits of the subject and finally the given situational conditions. If we transpose unity for each of the functionalities we get a simpler solution to reading. Also dependents of reading skills are far from linear as the author has suggested. 3. Some require less hard work than others to overcome so there is an element of preparation involved. 4. They don’t occur all at once it is interdependent and dimensional. I agree wholeheartedly with the findings of Mark Seidenberg’s 2017 book you can’t get better than that reinforces that no dyslexic is permanent or untreatable The woman who changed her brain - book by Barbara Arrowsmith Young. 1. The letters of the alphabet were designed to represent speech sounds; that is the alphabetic principle. 2. The alphabetic principle makes literacy easy, allowing the reader to pronounce words from their spelling, and the writer to spell them from their sounds. 3. As pronunciation changes through the ages, the alphabetic principle tends to be corrupted; the spelling of words then needs to be adapted to show the new sounds. 4. Unlike other languages, English has not systematically modernized its spelling over the past 1000 years, and today it only haphazardly observes the alphabetic principle. 5. Neglect of the alphabetic principle now makes literacy unnecessarily difficult in English throughout the world, and learning, education and communication all suffer. 6. Procedures are needed to manage improvements to English spelling as a world communication system. Obviously it’s our spelling that leads us to formulating these different teaching methods. It’s time for a spelling upgrade! I find it quite incredible that any investigation into the teaching of early reading and writing makes no reference to the considerable contribution of Dame Professor Marie Clay in this field since the 1980s. Goldilocks and Chinese whispers, indeed. Haven’t seen this type of muddled thinking and writing in years. “In our language system, children must learn how the alphabet works for reading and writing – ‘the alphabetic principle’. To this end, an emphasis on one key element of the Simple View of Reading, notably, decoding, has been necessary to restore the alphabetic principle to its essential place in teaching beginners to become skilled readers.” -Sir Jim Rose. When a spelling system follows the alphabetic principle and U see an unfamiliar word, U know how to pronounce it and when U hear a new word, U know how to write it. Teachers have trouble teaching and students have trouble learning reading and writing because English spelling so often violates the alphabetic principle. Its that “simple”. “The cueing system” seems to refer to the approach promoted by Marie Clay, who wrote in 1998 that beginning readers should be encouraged to use ‘their knowledge of how the world works; the possible meanings of the text; the sentence structure; the importance of the order of ideas; the size of words or letters; special features of sound, shape, and layout; an special knowledge from past literary experiences before they resort to left to right sounding out of chunks or letter clusters, or in the last resort, single letters’. All that the simple view of reading really amounts to is that the best readers have good word recognition and good language comprehension. Who can disagree with that? The problem with learning to read English, however, is that it takes many years to attain instant word recognition of even the most used words, because many letters and letter-strings do not have one-to-one relationships with sounds. At least 69 spellings have more than one pronunciation, like ‘o’ in ‘on, only, once, other’ (See EnglishSpellingProblems blog). This means that English decoding is far more difficult and time-consuming to teach than in languages in which all graphemes spell only one sound. It also means that learning to recognise all common words by sight plays a much bigger role in becoming a fluent reader of English, because it is far more difficult for pupils to help themselves when they get stuck on words like ‘thought, through, though’. The main cause of the endless debates about how best to teach children to read English is simply the chaotic nature of English spelling which makes this exceptionally difficult. The simple view of reading does not help anyone cope with it any better - The secret to becoming a good reader of English is mainly lots of practice with good support.